Natural & Artificial Flavor, Citric Acid, Sucralose, L-Tartaric Acid, Silica, Acesulfame K, Soy Lecithin, Dicalcium Phosphate, FD&C Red #40. Contains soy lecithin. Manufactured in a facility that processes milk, soy, wheat, tree nuts, and shellfish. Citric Acid, Malic Acid, Natural And Artificial Flavor, Sucralose, Silicon Dioxide, Acesulfame-K, Dicalcium Phosphate, Soy Lecithin, FD&C Yellow #5, & #6. As a dietary supplement mix 1 scoop (13.5g) of Aminolinx with 8-10 fluid oz. (240-300 ml) of cold water. Aminolinx can be consumed prior to training, during training and after training for maximum efficacy. For adults only. Consult a healthcare practitioner prior to use if you are following a low protein diet, are pregnant or breastfeeding. Vitamin B12 can mask folate deficiency. Consult a healthcare practitioner if you are uncertain whether or not you are taking adequate Vitamin B12. Consult your physician prior to using this product if you are pregnant, nursing or taking medication, under the age of 18, or have a medical condition. Discontinue use two weeks prior to surgery. Citric Acid, Natural And Artificial Flavor, Malic Acid, Sucralose, Silicon Dioxide, Acesulfame-K, Dicalcium Phosphate, Soy Lecithin, FD&C Red #40, & Blue #1. Contains: Soy Lecithin Manufactured In A Facility That Processes Milk, Soy, Wheat, Tree Nuts, And Shellfish. Natural and Artificial Flavors, Citric Acid, Malic Acid, Sucralose, Silicone Dioxide, Maltodextrin, Acesulfame Potassium (Ace-K), Soy Lecithin, Tartaric Acid, FD&C Red #40, Color FD&C Blue #1. 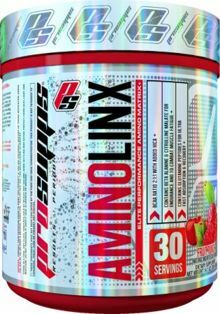 As a dietary supplement, mix 1 scoop (13.3g) of AminoLinx™ with 8-10 fluid oz. of cold water. 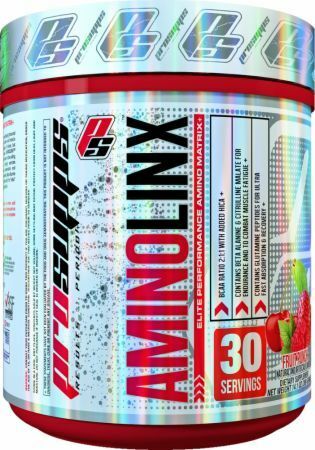 AminoLinx™ can be consumed prior to training, during training and after training for maximum efficacy. Consult your physician prior to using this product if you are pregnant, nursing or taking medication, under the age of 18, or have a medical condition. Discontinue use two weeks prior to surgery. Store in a cool, dry place. Contents sold by weight not volume; some settling may occur. Protect from heat, light and moisture. Do not purchase if safety seal is broken or missing. Citric Acid, Natural And Artificial Flavors, Sucralose, Silicone Dioxide, Maltodextrin, Acesulfame Potassium (Ace-K), Soy Lecithin, FD&C Red #40, FD&C Lake Red #40. Citric Acid, Natural And Artificial Flavor, Sucralose, Silicon Dioxide, Maltodextrin, Acesulfame-K, Dicalcium Phosphate, Soy Lecithin, FD&C Red #40. As a dietary supplement mix 1 scoop (13.7g) of Aminolinx with 8-10 fluid oz. of cold water. Aminolinx can be consumed prior to training, during training and after training for maximum efficacy. For adults only. Consult a healthcare practitioner prior to use if you are following a low protein diet, are pregnant or breastfeeding. Vitamin B12 can mask folate deficiency. Consult a healthcare practitioner if you are uncertain whether or not you are taking adequate Vitamin B12. Citric Acid, Malic Acid, Natural and Artificial Flavors, Sucralose, Silicone Dioxide, Acesulfame Potassium (Ace-K), Soy Lecithin, Maltodextrin, Color FD&C Yellow #5, FD&C Red #40. As a dietary supplement mix 1 scoop (12.8g) of Aminolinx with 8-10 fluid oz. of cold water. Aminolinx can be consumed prior to training, during training and after training for maximum efficacy. Contains: Milk and Soy Lecithin. Contains 0% Juice. AminoLinx BCAA/EAA Matrix. We are all “elite” athletes, aren’t we? Whether you are flipping tires and ropes, flipping other athletes, or moving heaps of steel, we all need a product that not only fuels our physical challenge of choice, but preserves the very muscle we look to develop. AminoLinx BCAA/EAA Matrix was formulated as the answer to the calling for a product that not only powers you through exercise STIMULANT-FREE, but aids in muscle tissue preservation and hydration. Infused with electrolytes for essential hydration, Beta Alanine & Agmatine Sulfate for optimal performance, AminoLinx is a “one-stop shop” for “elite” athletes that expect nothing less from a ProSupps product.